As a Brit, I’ve been looking at the current US “Race for 08” as an interested observer. Quite frankly, if you use the internet it’s hard to ignore. And it would be terribly naive of me to think that the upcoming elections will have no impact on me, it clearly will. If you need evidence to back this up, just look at the impact the US’s badly managed sub-prime mortgage situation has had on the entire world. And if you want to bring it down to a more personal level, have a look at your pension balance and the savings rate you’re getting. As an outsider, someone who has absolutely no vested interest in any of the runners, a few things become obvious. And after thinking about it, I’m really glad I don’t have to vote. Why? Why would I find it so difficult to vote in the election? And why is it so baffling? 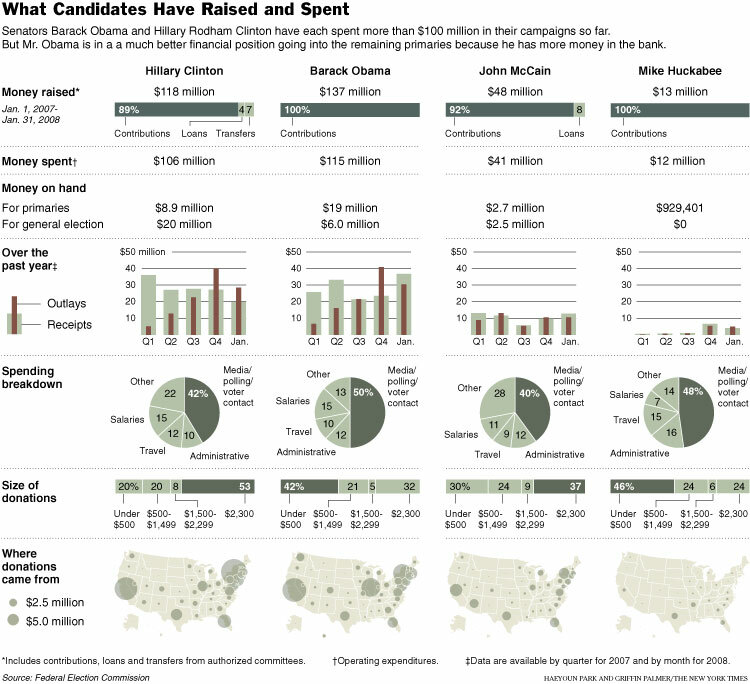 Reading through some of the coverage, the money involved in running for candidacy is obscene. For Clinton and Obama, we’re talking over $100 million each. To me, this means two things. Firstly, unless you can raise, at a minimum, tens of millions, you can’t compete. This effectively limits participation at the highest level to either the well endowed or the well connected. Secondly, in order to raise this level of funding, you have to have relationships with big business, or at least big business men (or women). When you’re talking about politics, this can only be an unhealthy relationship. It seems utterly bizarre that this is even allowed (and I know that we have a similar situation in UK politics, which infuriates me, but the level of funding in the US is on a completely different level). If a candidate is gifted, say $10million, there is surely promises made in return. There’s no way it would work any other way, despite what may be claimed. I can’t imagine going to the ballots and only having two options, but this is the reality for America. While many countries only have two parties that are viable options, very few have this built into the system. If my views, beliefs or policies lie outside of the Democrats or Republicans, I have no where to go. The main problem with this approach is that you get very low risk politics. There isn’t a Liberal Democrats party to test the waters of more speculative policies. Innovation in politics is often drive by the smaller parties, the ones who have nothing to lose and want to make a name for themselves. In fact, many would argue that the current British Labour party takes its inspiration from the Monster Raving Looney Party (ok, that was a low-blow but let’s face it, they have really lost the plot recently). If you compare this election to the last one, the faces may have changed but many of the fundamental policies are broadly similar. The American system is run very much on personality more than anything else. The Presidential Primaries are similar to the UK Party Leader elections, except they are played out in public, and voted for, in large part, by the public. The key difference seems to be the way in which the candidates approach the competition. The US Primaries effectively choose the two most suitable candidates for the White House, one from each party. Except the campaigns they run include a fair bit of character assassination. This is normal in Political Elections, we see it over here and it’s played out across the world. The stand out point about the American Primaries, however, is that the candidates are from the same party. They are, for all intensive purposes, trying as best they can to make the other delegate(s) unelectable. In the long run, the loser who runs the best Primary campaign may very well cause the party they are a member of to miss out on the White House. The concept of “the greater good” doesn’t seem to apply here. I’d like to point out at this stage that I’m not, even for a second, suggesting that the UK system is any better. Any political system where the Popular Vote isn’t the one that counts, is clearly deeply flawed (just look at the way Labour redrew the boundaries in its own favour before the last election, only to lose the Popular Vote but retain power). It can’t really be defined as a democracy if the person the majority votes for doesn’t win. I’m also firmly of the opinion that the current parties in the UK system are all unelectable. I don’t want to vote for any of them and I shouldn’t have to settle for the “best of a bad bunch”. Particularly, the tax increases under the guise of environmental protection is sickening and devious. Am I off the mark with my comments on the American system? Do people like/agree with it?